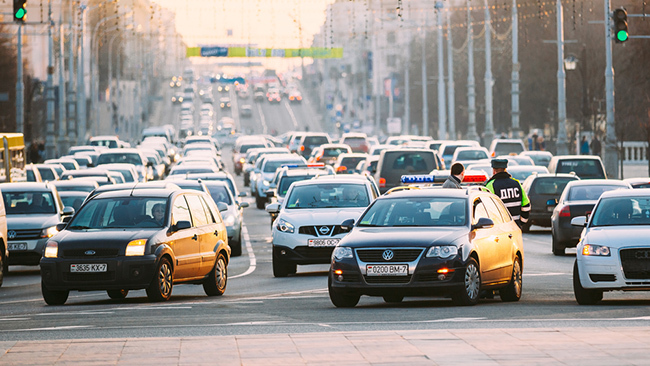 What would more traffic to your blog post mean to you? Image source. What would 100,000 views on a blog post mean to you? Depending on the goals of your blog, it could mean thousands of new subscribers and fans. But it could also mean new customers — big traffic means big exposure and big exposure means big growth. We’ve been publishing content at Groove for the last five years. We’ve messed up a lot, we’ve learned a lot more and we’ve grown from nothing to over $300,000 in monthly recurring revenue through content marketing. Today, our blogs are the single biggest driver of growth (as in, real money) for our business. A couple of years ago, we published a post about how we successfully drove traffic to our blog. 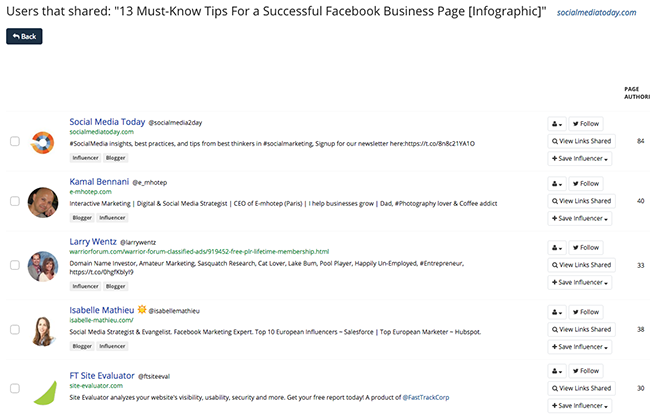 It outlined the step-by-step system that we used for influencer outreach. That post, not surprisingly, has become one of our most popular. We still use the basic foundation of that old system today, but it’s come a long way. Below, we’ll go through the entire “lifecycle” of a blog post, from idea generation to writing to publishing to promotion, to show you how to generate lots of traffic. We’ll use another one of Groove’s most popular posts — “We Deleted Our Facebook Page. Here’s Why.” — as an example. If your goal is to get 100,000 people to see your post, then you need to pick a topic that a lot more than 100,000 people are interested in. There’s huge potential in writing insanely targeted pieces, but if you want lots of traffic, start with a topic that already gets lots of traffic. Think of a highway with thousands of cars on it. 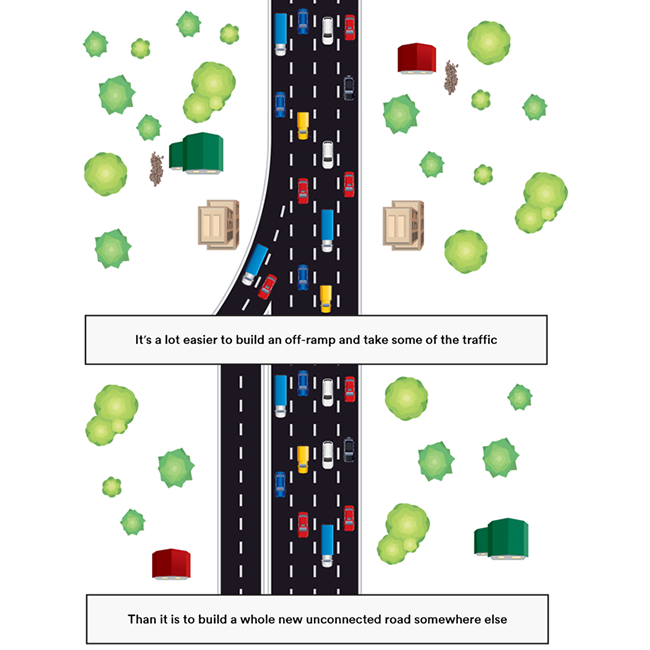 It’s a lot easier to build an off-ramp and siphon some of that traffic off of the highway than to build a whole new unconnected road and try to get cars to drive to it. How do you know you’re picking a big enough topic? Start with the problems that you know your market has (if you’re lost, here are some questions to ask to get you started). 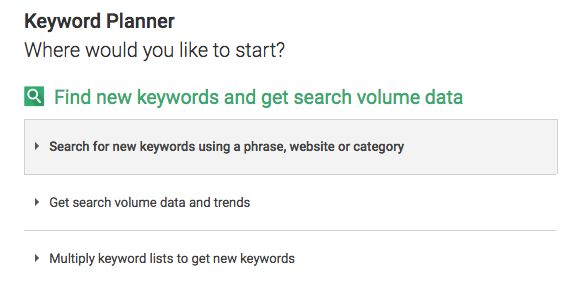 Start with simple Google searches, trying different terms around your topic (think like your reader, and use the exact language that you’ve heard your market use). It’ll become clear to you pretty quickly whether it’s a crowded market with tons of content written about it (good), or something that very few people write about and, therefore, care about (bad). 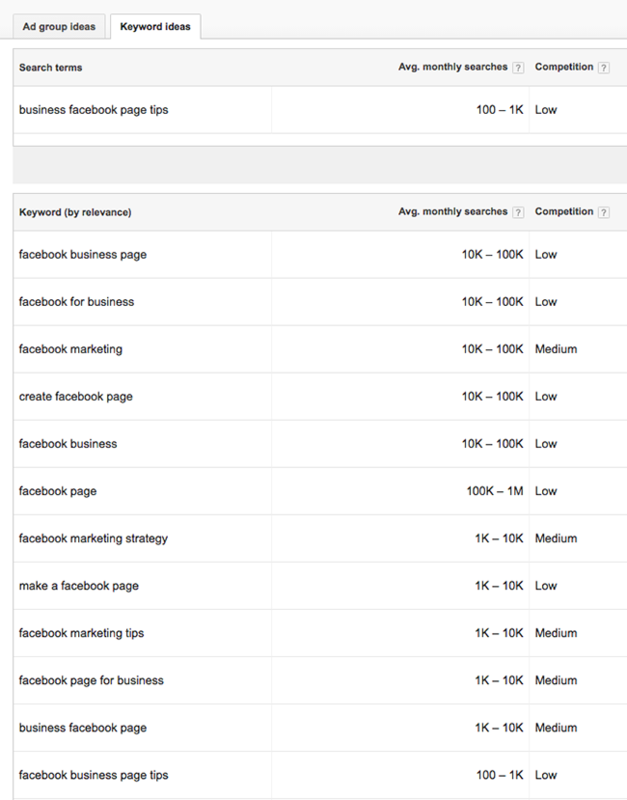 Keywords around the exact topic you want to write about should add up to a lot more than 100,000 searches per month. 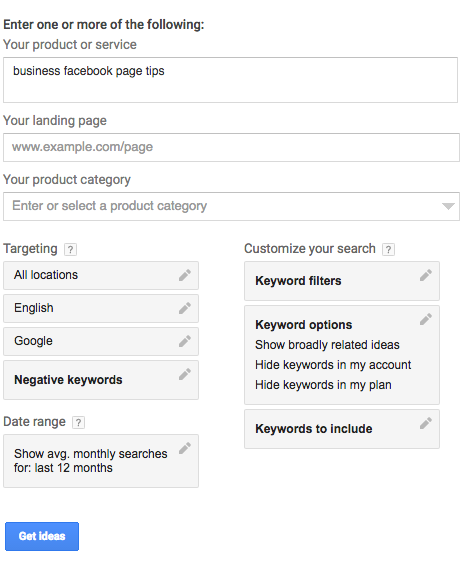 Again, we’re not going into advanced SEO here, and there’s lots more you can do with tools like this. But you don’t need to be an SEO expert to get lots of traffic. This step is all about getting practical validation about the audience size for your topic. Once you’ve picked a topic you want to write about, you can write your post. Valuable: Can readers take your post and DO something with it to improve their current condition? Interesting: Does your content make reader want to keep reading from beginning to end? Unique: Does your content stand out from the rest of the content being written about that topic? All three are “table stakes” for effective content marketing. But for the purposes of this post, where we’re focusing on traffic, let’s assume that you can handle making your post valuable and interesting… so let’s focus on the third: being unique. Imagine a choir singing a melody; everyone looks the same and sounds the same, so you can’t really tell the difference between any two voices. That’s what most content markets look like. Homogenous. Image source. Now imagine Kool-Aid Man busting through the brick wall at stage left and belting out a tune that nobody in the choir had ever even considered before. Kool-Aid Man turns heads. Kool-Aid Man is impossible to miss. Don’t join the choir. Be Kool-Aid Man. Image source. 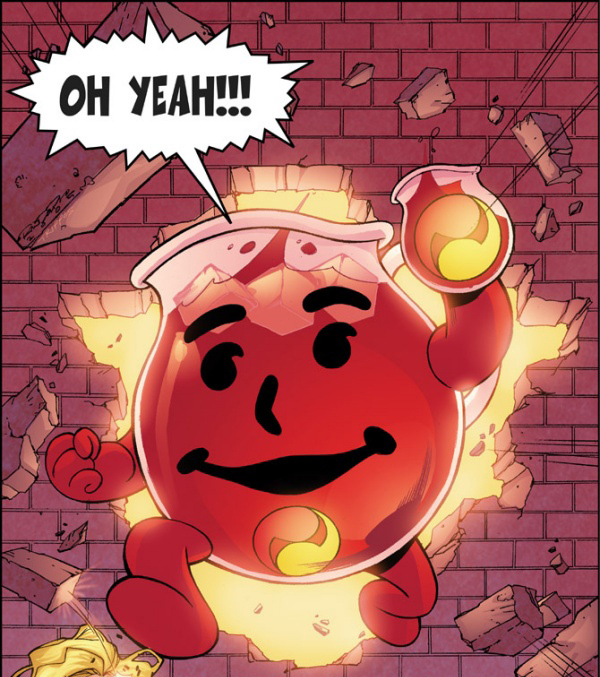 How can you be bold like Kool-Aid Man? The first step of which includes looking at how everyone else is approaching the topic. In our case, there were hundreds of articles about how to write for your business’ Facebook page, tips for promoting it, how to make sure that people saw it, what kinds of content to produce for it and so on. Everyone was part of the choir, talking about the best ways to approach Facebook for business. Facebook simply hadn’t worked for us for lead generation as well as other channels had, so in the spirit of focusing our very limited resources on only the highest-ROI efforts that we knew would work, we decided to delete our Facebook page and not spend any more time on it. We were happy that we did, and we thought that others could benefit from a bit of focus, too. And beyond that, we wanted to offer a reality check to remind readers that just because all of the “experts” talk about something, doesn’t mean you have to do it. And so we wrote the post, the one that busted through the brick wall and didn’t look or sound anything like the choir. Of course, when you write a post like this, a lot of people will disagree with it. Many will even be offended. But a lot of people will agree, too. And the more worked up someone gets about your post, whether they agree with it or not, the more likely they are to share it with others. So pick a side. The more contrarian, the better. And defend it vigorously. If you had 100,000 people on your email list, then getting 100,000 views wouldn’t be that hard. But let’s assume that you, like most people, don’t have a list that big (yet). Well, there are lots of people out there that do. This step is driven by simple math: it’s a lot more time-consuming to get your post in front of 100,000 people, one by one, than it is to put it in front of 50 people who will each want to share it with 2,000 others. That’s distribution strategy. It’s the “influencer marketing” that has become a bit of a dirty word because so many marketers are doing it poorly. Let’s go over how to do it well. This is the most time-consuming part of the strategy, but it’s critically important. 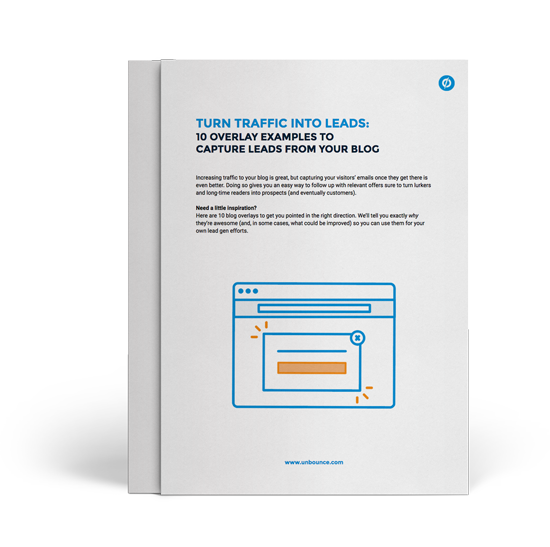 Skip it or skimp on it and you can kiss your traffic dreams goodbye. 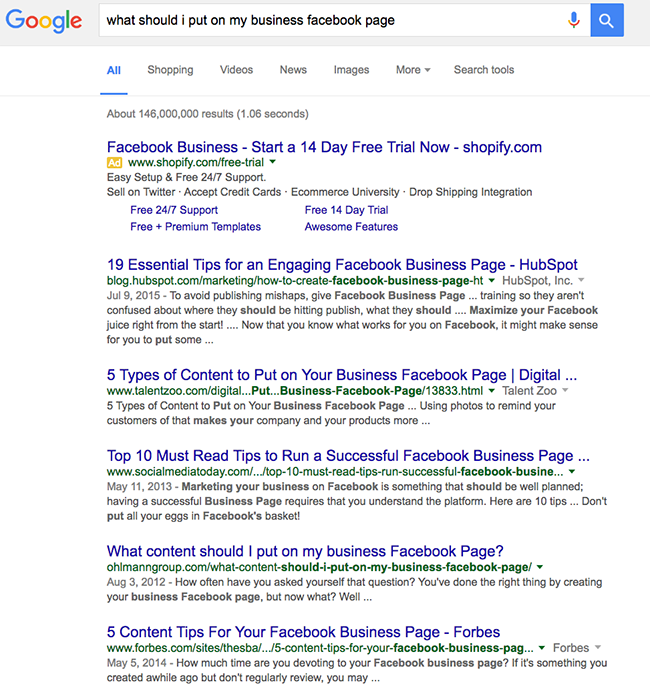 This used to be an extremely painstaking process for us that involved hundreds of hours of Google research. Now it’s just a pretty painstaking process that involves several hours of Google research, plus a few hours using BuzzSumo. Next, click on “View sharers” for each post. This makes for a terrific place to start your outreach. Get as many influencers as you can, cutting out the obvious dead ends (bots that curate content, fake accounts), and put them into a Google Sheet (here’s the one we use — just make a copy and steal it). Content marketing is a long game, and you’ll be a lot more successful if you view it that way. Nowhere is that more true than with influencer outreach. You’re a lot more likely to have success with influencers who know and trust you because you’ve put in the time to follow and read their content, share it with others and contribute thoughtful perspectives in their comments sections. These are efforts that pay off dramatically over time, and I recommend you begin blocking off an hour or two each week to do that with everyone whom you see as an influencer in your market. That will increase your success with this next tactic exponentially, though it will still work if you haven’t done this yet (it’ll just be harder). The next step is to tell influencers about your post. Take the time to make every outreach email deeply personal and honest: Mass emails are annoying and, often, useless. Nobody will want to build a relationship with you when it’s obvious that you’re sending them a canned outreach email. Personalize each email with an authentic reason as to why you’re reaching out to this person. 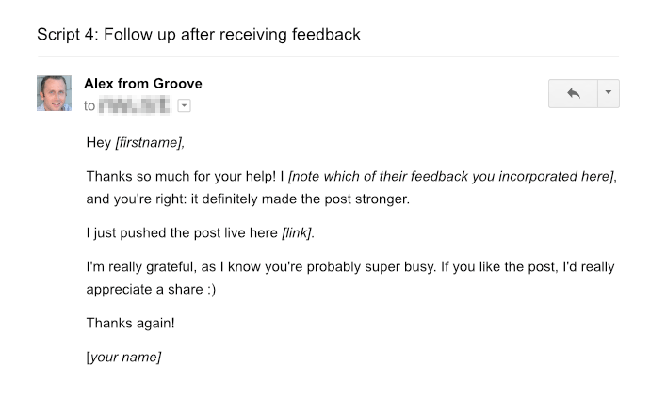 Never send your content in the first email: Almost everybody does this (“Here’s my post, please share it”). Not only is it rude, but it makes you look like everyone else. If you don’t understand why this is rude, read Permission Marketing. Ask for feedback, not promotion: Again, everyone asks influencers to promote their posts. Remember: don’t be the choir. Ask them for something that’s not only more valuable, but that they’re probably more willing to give: their feedback. The “authentic” in “authentic reason” is key. Find a post that they’ve written before, and actually do something with it. 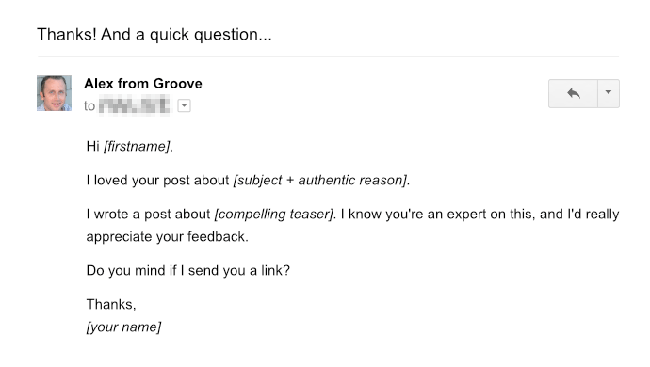 I know you’re an expert on this, and I’d love to get your thoughts on a post I’m working on about some surprising results I found when A/B testing subject lines. They’ll ignore you. Cool, move on. They won’t give you feedback, but they’ll respond. In some cases, because you didn’t do what 99% of marketers do (ask them to promote your post), they’ll do you a solid and share your content. #3 is the absolute best outcome you could hope for, because not only do you get helpful feedback from an expert on the topic, but now they’ve invested time in the creation of your post. Now it’s their post, too. If you repeat this process across 100+ influencers, you will eventually get big traffic. In the example above, the post hit 100,000 unique page views around 80 days after publishing. If you do this across 10+ different blog posts and different influencer markets, you’ll get even more traffic over time. And if you do it for a long time, you’ll turn your content into a significant and dependable source of new leads for your business. Because the first step to converting on-site visitors is getting them there in the first place. You won’t break anything, I promise. The worst that you’ll do is get a negative data point that you learn and grow from. As you can see, getting 100,000 readers takes both art and science. On the art side, writing is important and you have to make an interesting, useful and unique case. And you have to pitch it to influencers in an empathetic and honest way. But ultimately, the art gets you nowhere without understanding that achieving your 100,000-reader goal can be broken down using science: start with a much larger pool of readers, test different ways to build relationships with the gatekeepers, track what works and what doesn’t and keep experimenting until you get there. And don’t forget that you won’t win by joining the choir.